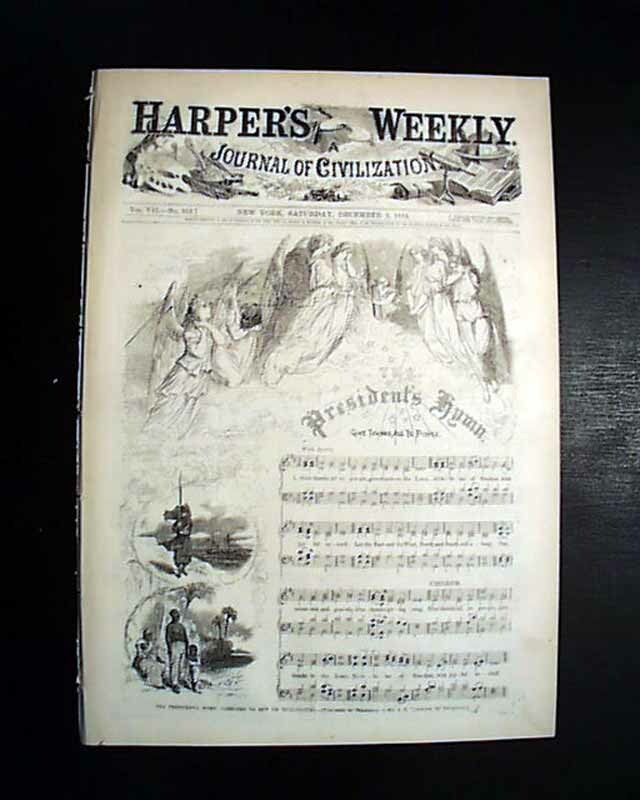 HARPER'S WEEKLY, New York, Dec. 5, 1863 The entire front page shows: "The President's Hymn--Give Thanks, All Ye People". 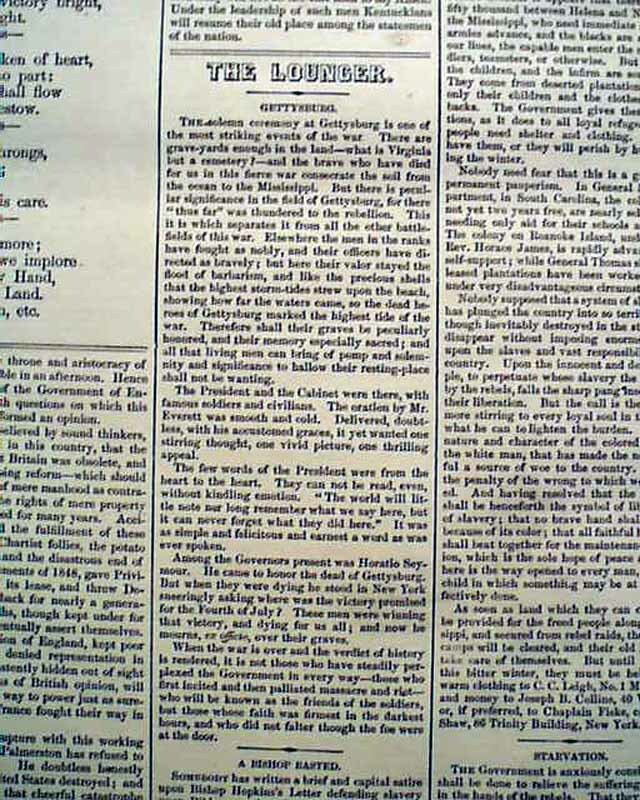 However, the most notable content is likely the detailed report of Abraham Lincoln's address at Gettysburg. While the actual address is not provided, considerable details and the rarity of reports make this worthy of interest (see image). 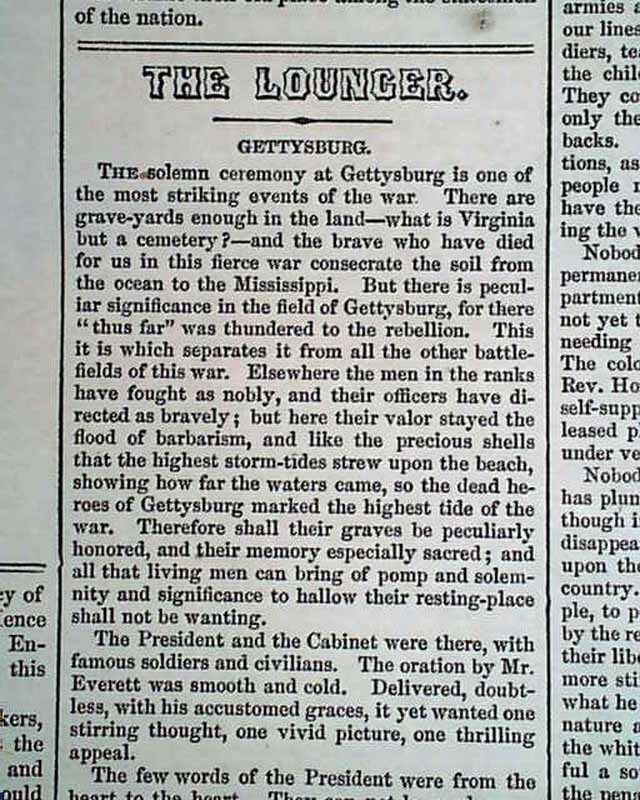 The article states in part, "The solemn ceremony at Gettysburg is one of the most striking events of the war..." (see below for the entirety of the first two paragraphs - worth reading). 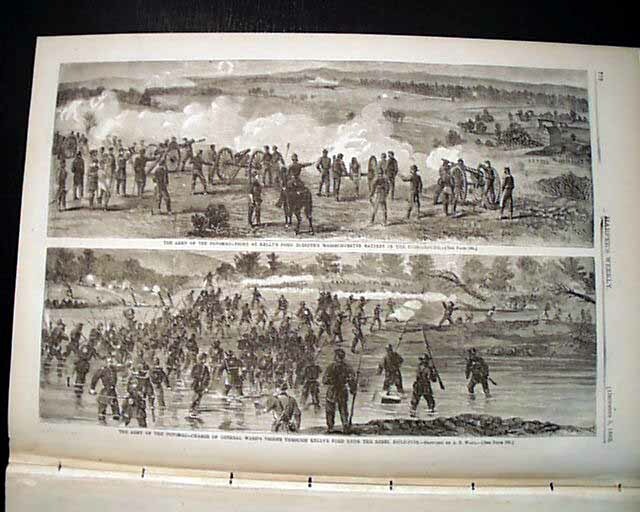 Inside has a full page with two prints: "The Army of the Potomac--Fight at Kelly's Ford, Sleeper's Massachusetts Battery in the Fore-Ground" and "...Charge of General Ward's Troops Through Kelly's Ford Upon the Rebel Rifle-Pits". 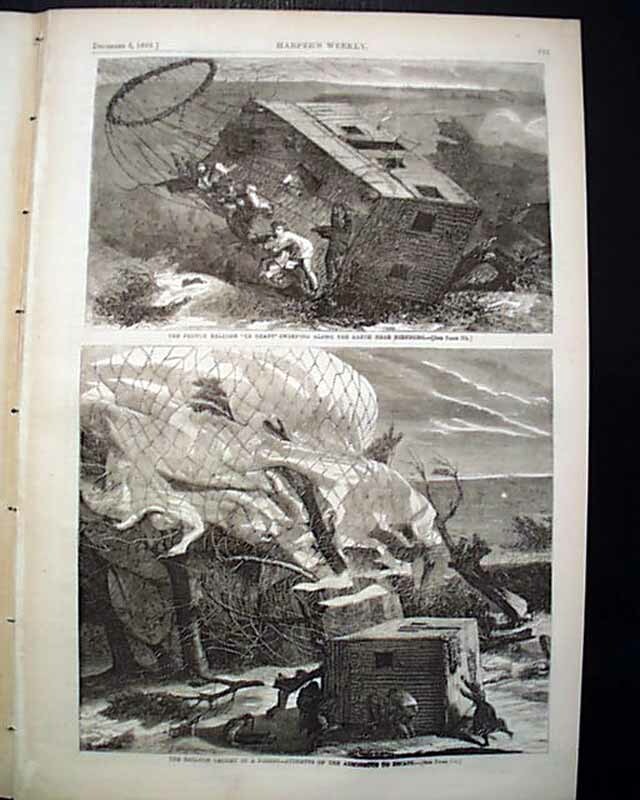 Another full page with 2 prints: "The French Balloon 'Le Geant' Sweeping Along the Earth Near Nienburg" and "The Balloon Caught in a Forest--Attempts of the Aeronauts to Escape". 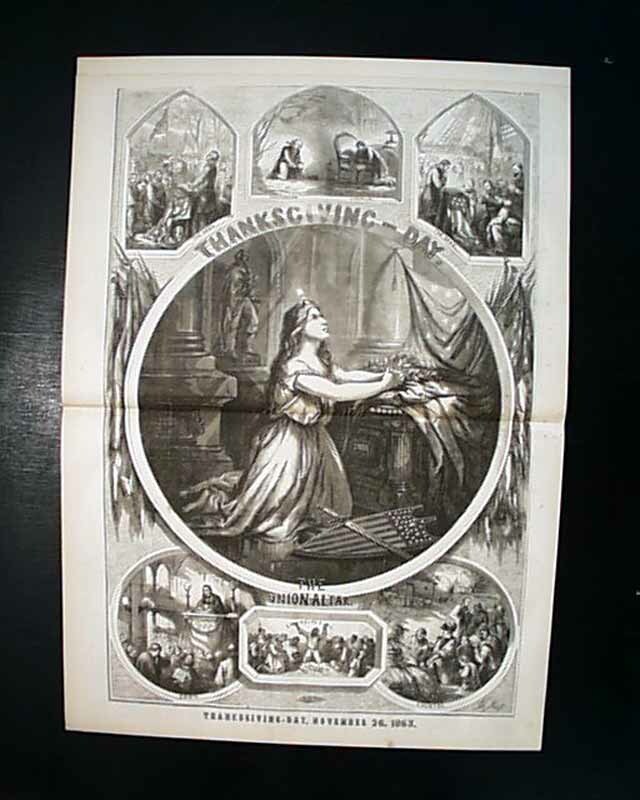 A very nice & dramatic Thomas Nast doublepage centerfold: "Thanksgiving-Day" is displayable and features 7 vignettes. 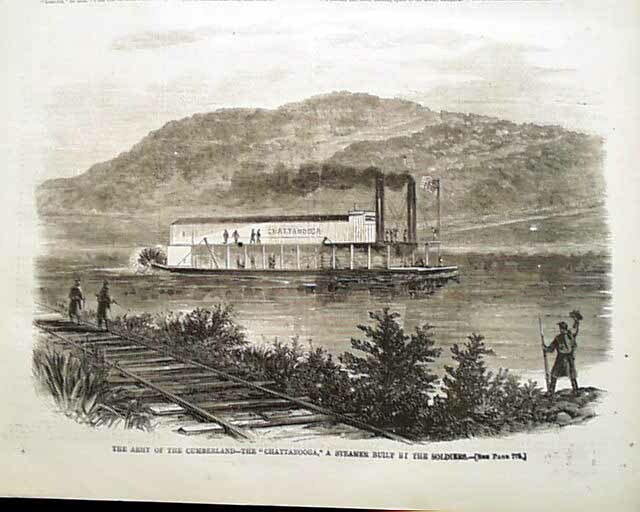 Other prints include: "The Prisons at Richmond--Union Troops Prisoners at Belle Isle" "The 'Chattanooga', a Steamer Built by the Soldiers" and: "Gen. Gordon Granger of the Army of the Cumberland. The back page has a cartoon: "In The Country." Complete in 16 pages and is in good condition. 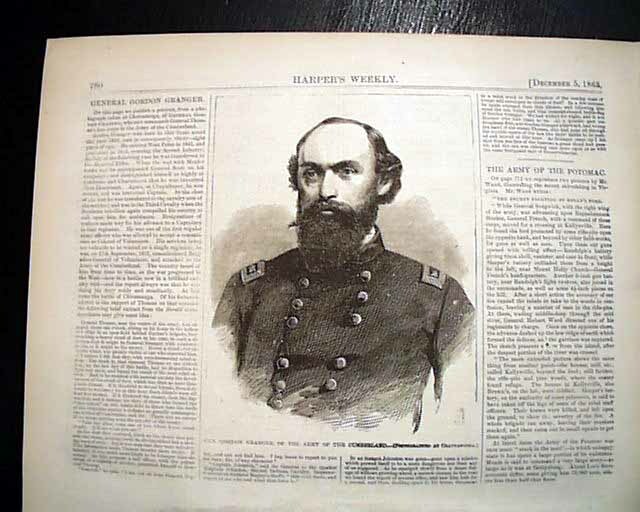 "THE solemn ceremony at Gettysburg is one of the most striking events of the war. 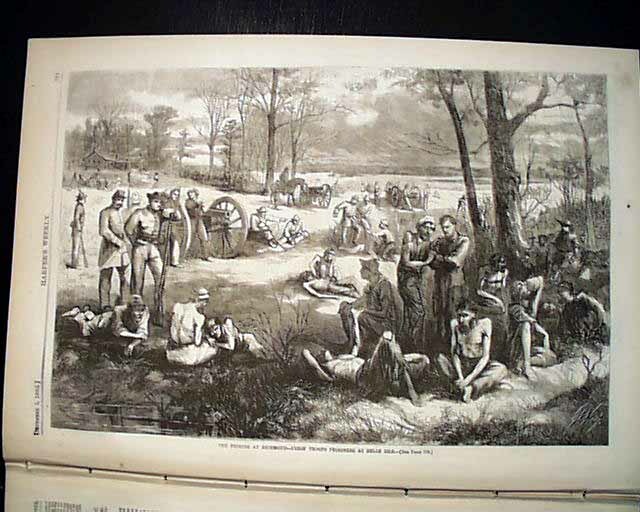 There are grave-yards enough in the land—what is Virginia but a cemetery?—and the brave who have died for us in this fierce war consecrate the soil from the ocean to the Mississippi. But there is peculiar significance in the field of Gettysburg, for there 'thus far' was thundered to the rebellion. This it is which separates it from all the other battlefields of this war. Elsewhere the men in the ranks have fought as nobly, and their officers have directed as bravely; but here their valor stayed the flood of barbarism, and like the precious shells that the highest storm-tides strew upon the beach, showing how far the waters came, so the dead heroes of Gettysburg marked the highest tide of the war. Therefore shall their graves be peculiarly honored, and their memory especially sacred; and all that living men can bring of pomp and solemnity and significance to hallow their resting-place shall not be wanting. The President and the Cabinet were there, with famous soldiers and civilians. The oration by Mr. Everett was smooth and cold. Delivered, doubtless, with his accustomed graces, it yet wanted one stirring thought, one vivid picture, one thrilling appeal. The few words of the President were from the heart to the heart. They can not be read, even, without kindling emotion. "The world will little note nor long remember what we say here, but it can never forget what they did here." It was as simple and felicitous and earnest a word as was ever spoken."